Our employees are what make Northern Engraving and our customers successful. They reflect our core values of Trust, Respect, Innovation, Service and Teamwork every day. It is their hard work and dedication to excellence that make a difference. 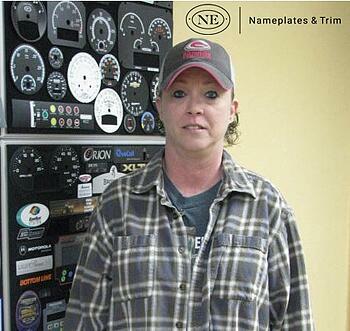 One person who displays these values is Michele McCarty at our Holmen, WI location. Twenty years ago Michele McCarty came to work at Northern Engraving in the Screening Department at the recommendation of some friends. We are glad she is here and appreciate her loyalty and time of service. “Northern Engraving has been a great place to come to work. I enjoy my job and the co-workers in my department. It is encouraging to know that if you stay motivated and work hard you will find opportunity to grow and advance within the company.